I have a new theory. If you buy bandaids at the store, you are basically giving your brain permission to allow your body to get major cuts so you can use those bandaids up. After moving into our new place, I headed to Target to buy a few essentials: advil, hair bands, Tums, allergy medicine. I walked right past the first aid aisle and thought I should probably grab a few things, just in case. I bought bandaids, neosporin, and rubbing alcohol. I honestly can’t remember the last time I had to wear a bandaid. But ever since buying some I have been cutting myself non-stop! First was when opening a box with a pair of scissors. I was holding these brand new scissors too tight, and sliced my thumb open, deep. And right on the crease, the worst spot to get a cut! That was 5 days in a row of bandaids. Then I was walking too fast out the door, and jammed my leg into the corner of the hanging blinds. Gashed myself. Didn’t help that I already had mosquito spray on, that one stung. Luckily it was nothing some neosporin and a bandaid couldn’t fix. The final straw was cutting my ankle last night shaving. I’ve been shaving my legs since middle school! How did I make such a rookie mistake? Oh, that’s right, because I jinxed myself by buying bandaids. Given my bad luck, I am shocked that I didn’t cut myself making the veggie noodles for this cucumber & carrot noodle Thai salad. Have you guys made veggie noodles yet? I am obsessed! Like, really obsessed. Even though it’s the same vegetable, the fact that they are in noodle form makes them somehow taste way better. You can use them to substitute pasta, and it really tricks your brain into thinking you’re eating pasta. You eat first with your eyes, right? 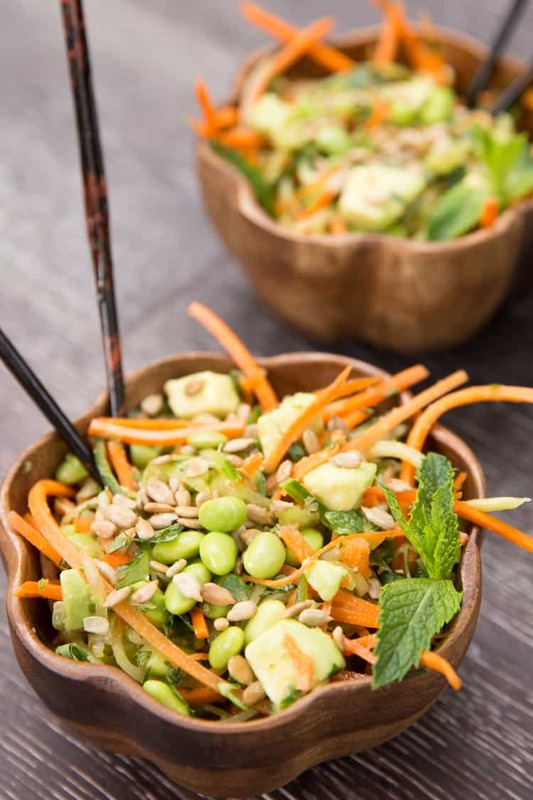 Or, you can use the veggies raw like I did in this cucumber & carrot noodle Thai salad. So far I’ve tried 2 methods to make the veggie noodles. I bought this hand held vegetable spiral slicer, and would give it a B+. It cuts medium size vegetables like cucumbers and zucchinis perfectly. The opening is too small to do sweet potatoes or eggplants, and it is not very good for skinny vegetables like carrots or parsnips. To make carrot noodles I use my mandoline with the julienne blade, as you’ll see in the video. Even better would be to use this Paderno spiral slicer, which I have been wanting to buy for a while. I just wish it wasn’t so big! I might just have to make some room in my kitchen for it, because I have heard nothing but great things about it. It is able to handle vegetables of any size. Plus! You can make 3 different sizes of noodles! 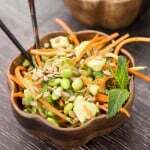 The flavors in this cucumber & carrot noodle Thai salad are amazing! 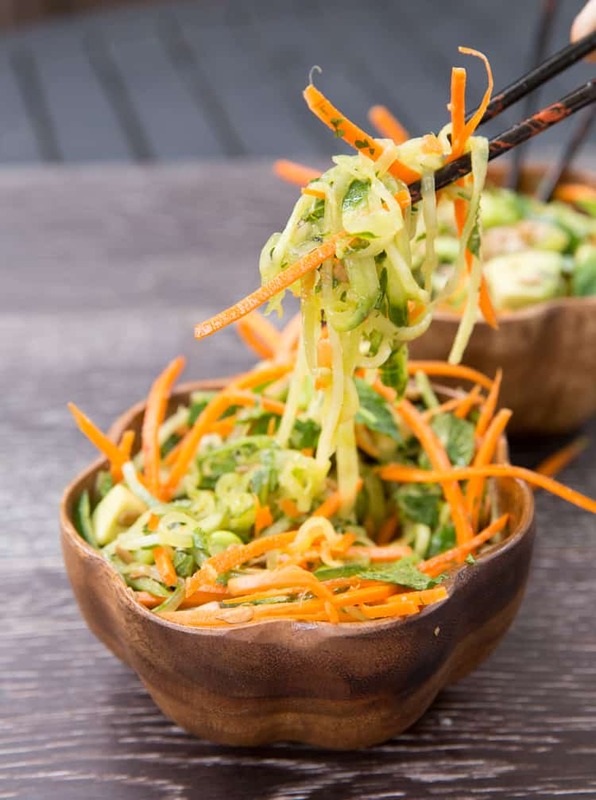 You have the cold and crunchy cucumber noodles tossed in a sesame peanut dressing then topped with cilantro, mint, edameme, avocado and sunflower seeds. Gahhh, drooling just thinking about it. I could eat this salad every day. And I just might because we don’t have AC, and the thought of having to turn on the oven makes me cringe. I’m all about cold salads, and this cucumber & carrot noodle Thai salad really hits the spot! 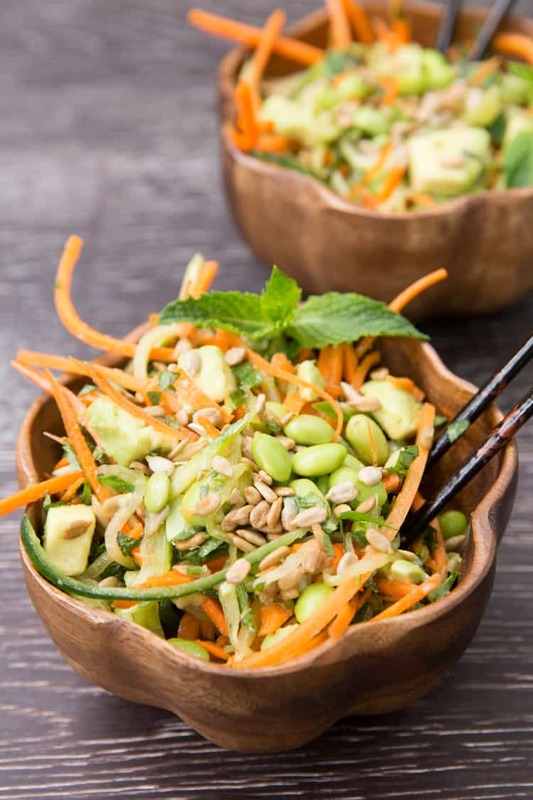 This cucumber & carrot noodle Thai salad is not only full of flavor, but it’s healthy too. It’s vegetarian, vegan and gluten free. Plus, I can make this entire cucumber & carrot noodle Thai salad and have dinner on the table in less than 15 minutes. Now get to making veggie noodles! *Use either a spiral slicer or a mandoline with a julienne blade attachment. Read the post for links to ones I recommend. **I don’t like spice, so I left these ingredients out in the video. But if you like a little kick to your salad add them! This Thai salad looks amazing — so fresh and delicious! Definitely what I’m craving on hot summer days. And too funny about the Band-Aids . . . I buy into your theory! I bought the super-duper-OMG-I-really-hurt-myself size because Spencer got a big cut and I thought he might want to cover it (he did not), and then I thought . . . well, what am I supposed to do with such a weird, oddly specific box of Band-Aids now? But, well, they’ve gotten used. Too much. Crazy! Hahaha! Ohh the bandaid jinx. Irritating but amusing all at the same time. ;) And this salad! Girl, these have got to be your most gorgeous photos yet! LOVE all the colorful veggie “noodles” and that dressing sounds incredible! PERFECT summer salad right here. ;) Pinned. This looks really refreshing! I have not yet tried veggie noodles, I really want to! Hope all your cuts heal up, you poor thing! I am kind of obsessed with this! I have been in such a salad rut, this looks amazing!! And how cute are those little bowls?! Ouch! Sounds like you’ve had your share of band-aid moments recently, Natalie! Hopefully that is all out of your system now, and you can be pain-free! This thai salad looks delicious! I love the addition of the edamame. Beautiful presentation, too! YUM! What a great, fun, healthy recipe!! YUM :) LOVE carrots! This looks perf for a warm summer day!! This salad looks so fresh and so vibrant. I love the bowls too and i love my Paderno spiralizer, but you are right it is a bit on the larger side. Have a great weekend friend. Eeeks on all the cuts, definitely no fun :( Hope they heal up soon. Love love love this salad, though! I have been having so much fun with different veggie noodles lately and would gobble this up in no time:) The edamame and avocado sound fantastic in here and the bowls are so so pretty! Ha ha, the bandaid jinx of 2014! That sounds like something that would happen to me. I am also obsessed with veggie noodles. I mean you can have your decadent creamy sauce and it’s ok because it’s on top of veggies! This salad sounds like my next obsession. Can I tell you I’ve made your arugula/peach salad about a bajillion times and was talking it up today with my coworkers. Obsessed. this look so GOOD (never thought i would say that about a salad!) .. the colours are so vibrant! definitely saving this recipe to try in my kitchen, thanks natalie! Sounds about right with buying band aids it’s like a curse! I love this salad too! It looks so fresh and vibrant – a perfect way to eat some veggies too! Finally getting around to reading this post!! Omg that big spoonful of PB in the video!! Adore that sauce flavor combo! Such fancy nancy equipment you have! Love how it cut everything up! Need to try this Natalie! Such beautiful colors and flavors, and obviously I like Thai ;) as for your bandaid situation…oofta! No fun! And so ironic that you just bought them. We are too similar because I tend to hurt myself all the time in similar ways! Always bumping into things! Oh well! What a beautiful salad! I love the flavors of Thai food! LOVE! Sorry that you keep cutting yourself!!! The band-aid curse – that is so funny! I love this salad – Thai flavors are the best. This looks so healthy and refreshing! I think you may be on to something. As long as we don’t have band-aids in the house, we never need them. This salad looks amazing. I love the flavors of Thai food and those vegetable noodles look so good. OMG… thats the worst. When I was training to be a chef, I went through a good many months of this jinx, it was like my brain knew there was a sweet first-aid kit hanging on the wall and it didn’t matter. Even worse… kitchen bandaids are bright blue so you can see them in the food if they come off. Gross! Got over that – thank goodness! Maybe your subconcious knew about a streak of self-harming behaviour and planned wisely! ;) Veggie noodles? Love them! For me this is a beautiful way to eat zucchini, which I can’t stand cooked anymore, but which are always so very cheap around here (Belgium). I wish I could get edamame and decent avocados, though. Thanks ffor sharing your thoughts about standup mixer. The meal looks delicious!~ do you think the salad can be made as a prep meal? Thanks Olivia! This can definitely be made as a meal prep. I make these in mason jars! I layer it: dressing on the bottom, then carrot and cucumber noodles, then soybeans, then mint and cilantro on top. Seal them and put them in the fridge for up to 3 days and they’re good to go! I cut the avocado and add it in right before eating it. A great balance of sweet, sour, herbacious and salty in the dressing. Love this dish!